Darrell Batterson is no stranger in Jasper County. He has been a regular volunteer for Jasper County Conservation for over 12 years, and was a Conservation Officer for the Iowa Department of Natural Resources in Jasper, Marshall, and Grundy Counties for 30 years. In 2017 alone, he volunteered for over a dozen Jasper County Conservation programs. Darrell assists with programs such as their huge 240 kid field trips, fishing derbies, hunter safety education, youth mentored hunts, Halloween hikes, and their 3 km trail race, often running and winning it and jumping in to help calculate the race results. He has been a presenter for the Older, Wiser, Livelier Seniors program, and he even helped install two playground sets at Jasper County Conservation Parks. Thank you Darrell for all your years of hard work protecting the land and wildlife and educating so many people. For two years Jenny Koska has been talking trash. And lots of it too! Well, that is to be expected when you are the Education and Outreach Coordinator for a landfill. Jenny has expanded the Metro Waste Authority’s (MWA) programs. They now have programs targeted at high schoolers, something new for MWA. She has also increased the rate of landfill tours by 163%! Jenny incorporates Next Generation Science Standards (NGSS), Iowa Core English Language Arts (ICELA), and the Iowa Core Social Studies Essential Concepts into her programs. If a teacher wants a program that is not currently offered, Jenny will even custom design a program for them! Speaking of teachers, Jenny has also expanded their professional development course to reach new school districts and has even added another professional development course. Thanks Jenny for expanding the reach of MWA to better educate Iowans. 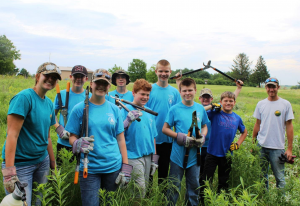 Twelve kids, ages 12 to 19, were crew members of the Youth Conservation Crew for Jones County Conservation last summer. They met every Thursday in June from 8:00 am until noon. Youth participated in a variety of activities from looking for monarch butterflies to clearing shrubs and trees in a prairie. 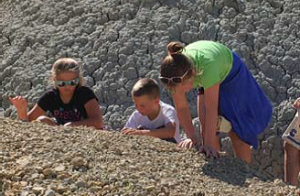 Central Park’s dry lakebed even received some help as the kids scavenged the area for trash. Kids found things like shoes, antique bottles, and even a tackle box! It was a great way to help with the lake’s restoration project. Michele Olson led the crew and said, “It’s about teaching the kids leadership skills, working with their peers, experience in the field, and cooperation.” Thanks Michele for getting the Jones County youth outdoors and actively involved in projects. Bob and Connie Van Ersvelde are a beak above the rest in Jasper County. They purchased some degraded farmland south of Grinnell and have been working to restore the prairie, oak savanna, and woodland areas over the years, turning it into their own small nature sanctuary. 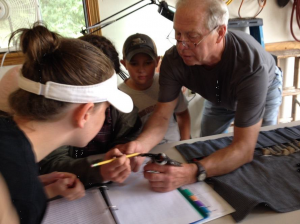 Since Bob is a licensed bird bander, Bob and Connie host bird banding programs on their property throughout the spring and fall migrations and even all summer long to monitor nesting species. They band hundreds of birds every year with the help of preschool students all the way up to college students and adults. In 2017 alone, they had about 125 participants assisting with bird banding. Bob has worked a great deal with Grinnell College and is getting started with a banding program at Lake Red Rock. Jasper County Conservation even takes their camp kids to Bob and Connie’s property to band birds and learn about their restoration efforts. Bird banding is a camp favorite! Bob and Connie even help Jasper County Conservation with an after-school program for fifth grade students to formax birds. The 10 year old program has 20 -30 participants each year. Bob and Connie also help Jasper County with forxmaxing public programs and have even presented formaxing birds at the annual IACCBE Winterfest Workshop. Thanks Bob and Connie for sharing your knowledge and expertise. Since 2013, the Metro Waste Authority has been lending a helping hand to local streams in central Iowa through their Adopt-a-Stream Program. People in the metro area form teams and choose a section of a stream they want to adopt. There are currently 26 teams, which range from families, to Boy Scout Troops, to teams of distillery employees. Volunteer teams choose a section of a stream from the Metro Waste Authority’s updated, interactive map that shows stretches of streams around the metro area that are in need of help. That map makes it easy for groups to choose a location that is both convenient for them and also impactful on the community. The Metro Waste Authority also has a 21-page Stream Cleanup Guide, which helps with the logistics of a stream cleanup from notifying the media to liability waivers. Besides the Stream Cleanup Guide, Metro Waste Authority also provides all the necessary supplies to complete a stream cleanup, from trash grabbers to trash bags. They even help connect the volunteer group with the local city staff, so the garbage can be disposed of properly. 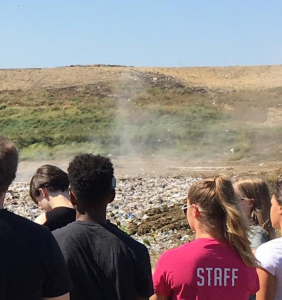 Through this program, Metro Waste Authority gives all residents the opportunity to interact with a local government agency and gives them the tools and motivation to take their passion for water quality a step further. Both birds and people have been flocking to F.W. Kent Park! Johnson County Conservation Naturalist, Sydney Algreen-Hunter, has teamed up with bird banders Robert Bradley and Mark Bowman to create a phenomenal program. They have been banding passerines at F.W. Kent Park since 2014 and have identified over 70 bird species that utilize the park. Facilitating almost weekly banding events from January through October 2016, volunteers spent 585.5 hours banding birds, training and educating new volunteers, and presenting educational programs. During this same time, 21 individuals volunteered to aid in bird banding efforts and education. All of these volunteers helped to reach a total of 940 students, parents, and members of the public during different banding events. Now that is something to tweet about! One might say Heidi Reams is a “jack of all trades” in her role as a Naturalist for Floyd County Conservation. She does her normal programs, but also assists with fall and spring prairie burns, cabin/lodge usage at the Tosanak Recreation Area, and grant writing. In 2017, she even became a certified drone pilot! She can now take videos of the conservation areas from a unique view to highlight features and entice new visitors. 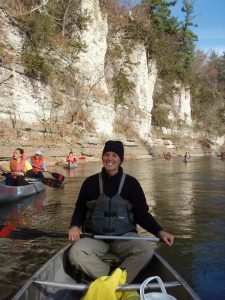 Heidi is also responsible for the Floyd County Conservation website, social media pages, and the Fossil & Prairie Center website. During the 2016-17 school year, 122 programs were presented to classes in preschool/transitional kindergarten through fifth grade at the three public schools in Floyd County. Class sizes range from 16-25 students per class with some grade levels having up to five sections. As of December 1, for the 2017-18 school year, Heidi has presented 104 programs with contacts of 2,995 individuals. Outside of the schools, Heidi presents public programs, workshops, monthly nursing home programs, monthly newspaper articles, bi-yearly newsletter, and day camps. Thank you Heidi for your hard work and dedication. With a six team member crew, Story County Conservation boasts over 75 years worth of experience! Their expertise attracted 34,398 people last year over the course of their 1,116 programs. The team visits eight preschools, all 15 elementary schools in the county, four middle schools, and two high schools. 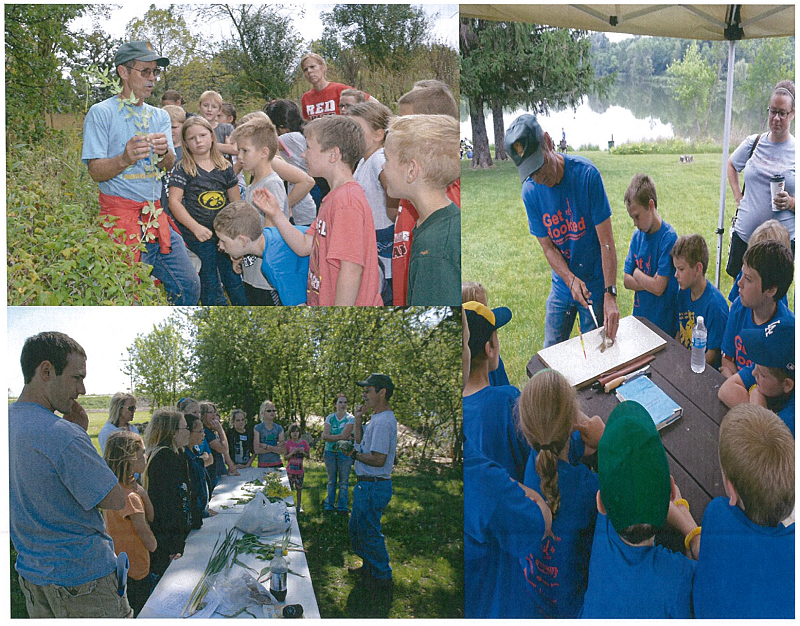 Story County Conservation offers 31 different classroom programs and 18 outdoor experiences/field trips. They do the normal stuff, but they also do unique programs like electricity, inventions, digestion, survival, and circulation. Not only that, but they have overnight river trips for camp and a yearly backpacking trip! Recently, one of their team members, Heather Hucka, was named as the National Association for Interpretation 2017 Master Front Line Interpreter! Congratulations and thank you Story County Conservation, for your dedication to interpretation and providing unique opportunities and programs to so many people. Dave Stedwell has been a common name for Clinton County Conservation over the past five years. He is currently the President of the Clinton County Conservation Foundation and an Officer for the Friends of Rock Creek. What makes Dave special? His willingness to jump into a Naturalist position and lead sessions all day. Clinton County Conservation had one of their Naturalists sustain an injury and they had a busy fall schedule approaching. 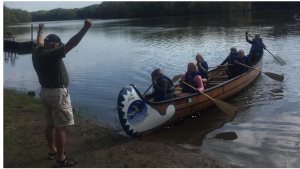 Not wanting to turn groups away, Dave jumped right in and volunteered to teach things from pond studies to how to paddle a 29 foot long, 14 passenger voyager canoe! He arrived early every day to set up and stayed until every last piece of equipment was put away. He even took out the garbage! Over a critical six week stretch in September and early October, Dave worked 13 field trips for 745 students and their teachers. Thank you Dave for your dedication to environmental education. 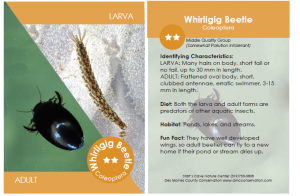 Similar to Pokémon or baseball trading cards, Des Moines County Conservation created water quality trading cards featuring 22 benthic macroinvertebrates they commonly use for evaluating water quality. Every year at the Starr’s Cave Nature Center Park and Preserve, they hold a public event called Critter Catch. It is essentially a bio blitz where families come to find and catch any organisms they see in the creek. A large part of this program is educating the public about the types of life found in their local water as well as teaching them about water quality. The water quality trading cards engage children and adults, getting them excited about organisms which otherwise might not be exciting to them, and connects the dots between diversity and water quality. The cards were a smash at their annual Critter Catch public program, which had more than 200 individuals in attendance. Quite a few families went home with entire decks they loved the cards so much! 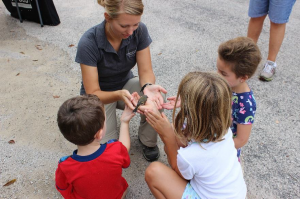 After receiving a grant from the Resource Enhancement and Protection Conservation Education Program (REAP CEP), the Starr’s Cave Nature Center Staff are developing innovative programs and educational totes teachers can use in their classrooms. These cards will be included in these educational totes available for free check-out for all the schools in Des Moines County, which serves nine elementary school. Thanks Des Moines County Conservation for creating these creative cards to educate the public.